Eleaf Mini iStick Box MOD Battery integrated built-in 1050mAh battery. The mod can can reach 10W max output. Pocket mod. 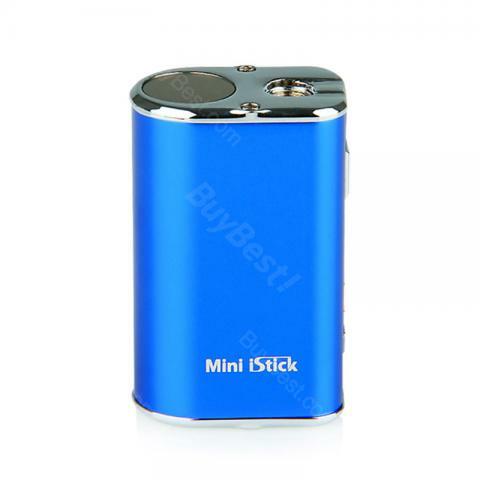 10W Eleaf Mini iStick is a tinier and simplified version of the original iStick. This tiny size makes it a perfect fit when holding in hand or putting in the pocket even while an atomizer is attached. With the Mini iStick, you will be able to carry a pocket friendly device while still enjoying a satisfying vape! • Top LED digital display: Display parameter (vaping seconds, battery power, current voltage) in a circular digital screen. The Mini iStick box MOD can be turned on by 5 consecutive clicks. Press the up-and-down arrow buttons to increase/decrease the working voltage between 3.3V to 5.0V. Mini iStick can be charged through Micro USB port at the bottom of battery. It will take 1.5 hours to charge the battery with 1A wall adaptor. • 3 months guarantee for batteries. • Note: We now need serial number to proceed after-sales service. Please kindly preserve the serial number of product if it's available. il s'entend très bien, vraiment un joli mod, petit et tient dans la main ... Il y a un clipper plus léger sur les photos pour l'échelle. Avec la tension réglable, costume parfait avec mon atomiseur, et je le mets habituellement sur ma poche, très pratique. Je vais le partager avec mes amis. this is the second time bought this lovely mod, I will definitely recommend to all of my friends getting this device, it brings me perfect vaping experience, with perfect size when holding in hand,top LED digital display is so amazing.I love it, lover you perfect seller. Everything perfect. The mini istick mod fires quickly without no delay. really beautiful. looks and feel it's authentic by eleaf.